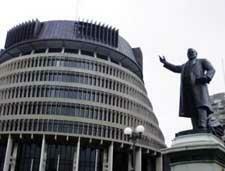 Anyone who suspects there is a lack of leadership at the heart of New Zealand goverment will have their suspicions confirmed — at least as far as IT leadership is concerned — by a recent report on Parliamentary computing. A hard-hitting review of Parliamentary management and spending is calling for better coordination of IT services on the Parliamentary campus. It also opens the door for the creation of a Parliamentary CIO role, calling for someone to take on a “clear and mandated leadership role”. Greater co-ordination and consolidation of Parliamentary ICT systems, possibly with more outsourcing of routine functions, looks likely as a result of the report, tabled in Parliament this month and written by well-known businessman and chairman of the NZ Lotteries Board, John Goulter. The report comes after review of a “joint information strategy” for Parliamentary agencies, which was drawn up in 2005 but has not been translated into practice so far. Five agencies are involved in the running of Parliament: the Department of Prime Minister and Cabinet; the Office of the Clerk; Ministerial Services, the Parliamentary Counsel Office and the Parliamentary Service. They are assisted by the executive support unit of the Department of Internal Affairs. “Each entity has its own organisation structure and resource requirements,” says Goulter’s report. Yet “all five agencies also have common needs. “Significant scope would seem to exist for rationalisation and/or centralisation of a range of services and functions, while allowing for the distinction between the agencies providing services to executive government and those providing services to Parliament,” Goulter says. The “range of services” includes ICT, which has a specific section devoted to it in his report. Goulter points to examples of inefficiency through separate development, such as the production of electorate databases by parties and MPs independently. “Electorate databases are essentially a ‘commodity’ that could be produced once, centrally, for all parties without compromising their autonomy,” Goulter says. He also criticises the recent recruitment of 11 staff by the Office of the Clerk to develop applications specific to the business of the House. The four agencies that operate on the Parliamentary campus (those mentioned above excluding Ministerial Services) and the DIA unit formed a joint Parliamentary Agencies Information Committee (PAIC) in the wake of the previous appropriation report, in 2004. This came up with a “joint information strategy” (JIS) the following year. The JIS identified areas for action. “It appears that progress is being made in terms of greater recognition of common interests and awareness of the need to work together,” Goulter says. “It is not obvious owever that this has yet been translated into any real tangible action”. Goulter says it is his view that Parliamentary Services should take over the role for the whole campus. However, it is handicapped by having a staff of only two in its ICT group, supplemented by services from Axon. The report is now with the Parliamentary Service Commission, a multi-party body of MPs chaired by the Speaker.